Twin/double (L-shaped, outer walls 16’6″ x 10′) on second floor. Roomy bathroom with wc. Twin/double (L-shaped, outer walls 16’6″ x 10′) on first floor. Roomy bathroom with wc. 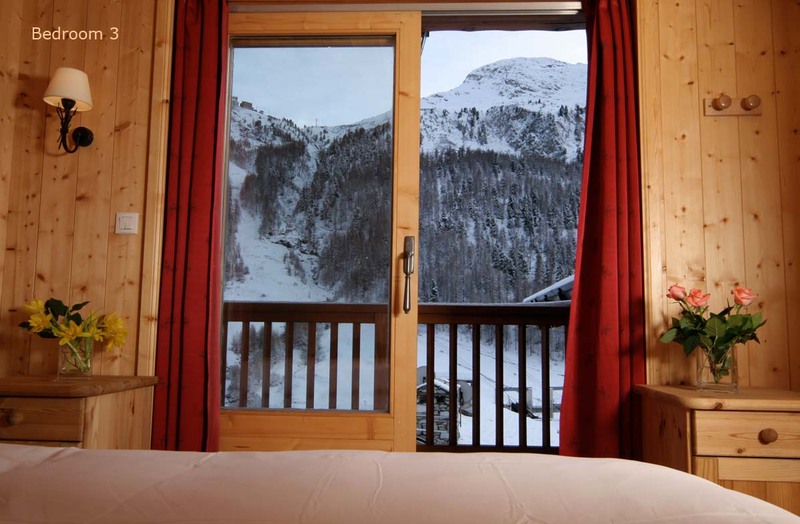 Twin/double (10′ x 7′) on second floor, big french windows to large balcony with superb views south up pistes. Small bathroom with wc. 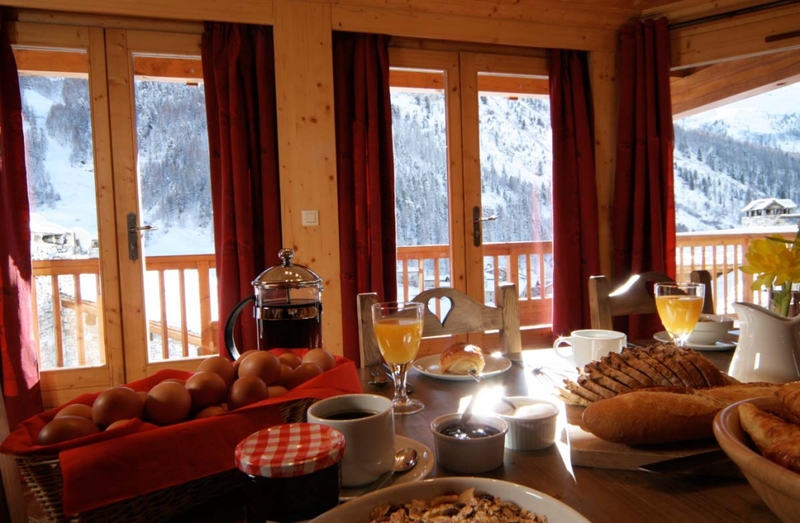 Twin/double (10′ x 7′) on first floor, big french windows to wide terrace with superb views south up pistes. Small bathroom with wc. Twin/double (12′ x 9′) on first floor leading off the sitting room. Bathroom and separate wc. (23′ x 15′) Bright, south-facing, split-level room with vast bay windows, balcony and marvellous views. TV and DVD. Open-plan kitchen. WiFi. On the floor below the sitting-dining room. 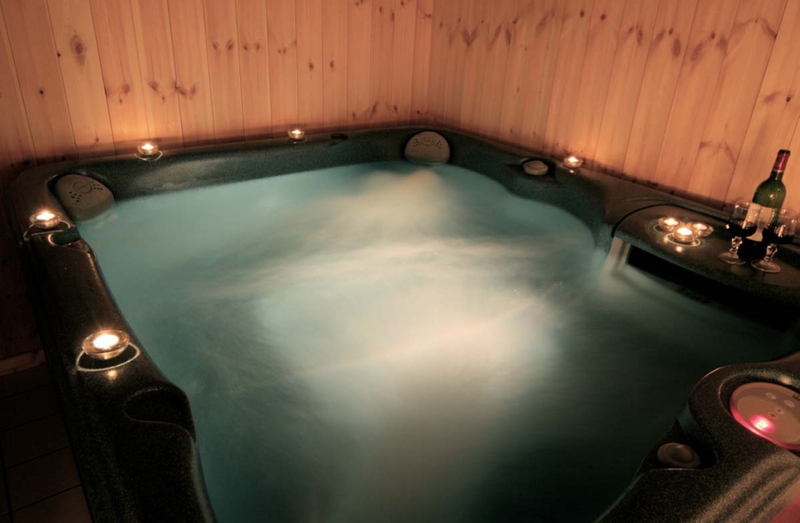 Indoor hot tub, plus sauna. 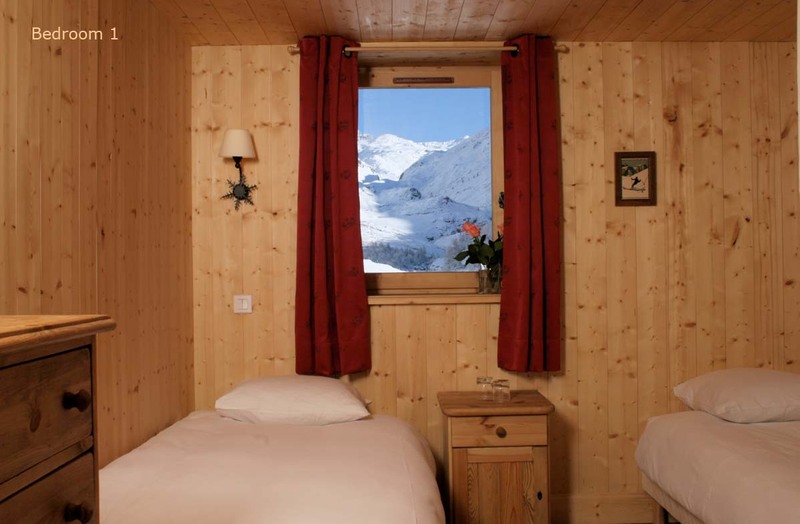 Grand Torsaï is the second of our two chalets in Le Fornet. It is slightly beyond and above La Couchire (forty-five seconds beyond, to be precise, along the same underground passages, and fifty steps above, though with the ski locker and boot warmers sensibly at the bottom). If you have already read the description of neighbouring chalet La Couchire, you’ll have read all about what a great place Le Fornet is. 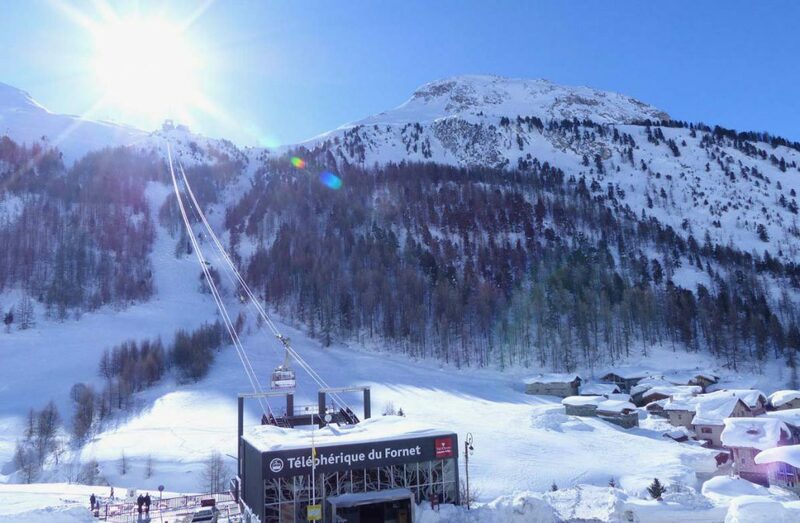 In a nutshell, the highest and emptiest pistes, the best powder, the Pissaillas Glacier with its exhilarating blue and red runs, and much of the area’s off-piste are all reached via the cable car, two minutes from this chalet. So are two of the best mountain restaurants, the Signal and Edelweiss, as well as the La Cascade restaurant up on the glacier. The hamlet of Le Fornet itself is the prettiest part of Val d’Isère, and has more excellent restaurants such as the popular Arolay and the Michelin 2-star Atelier d’Edmond. 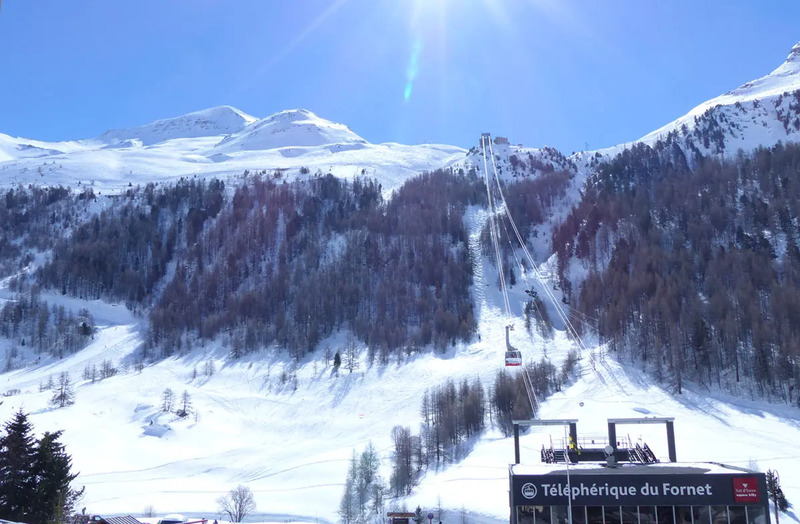 Should you wish to go into the village centre, to the nursery slopes or the shops, the free bus stops just outside the chalet until after midnight, and you can reach the nursery slopes or nightlife as fast as people staying in the village centre. Grand Torsaï was built around 10 years ago, and is very pretty and very pleasantly finished. Two of its five bedrooms are admirably compact, but with enormous sliding windows and wonderful views. The other bedrooms have more space and great views, but only normal-sized windows. All have smart bathrooms. Down one floor are the sauna and the indoor hot tub. The split-level sitting-dining room is the heart of the chalet, in particular the large square dining table and the vast picture windows. Romantics appreciate the sunniest views in Val d’Isère, stretching from dawn over the Galise, on the border with Italy, to dusk beyond Bellevarde. Non-romantics can log onto the web via WiFi or watch a DVD.